ThermalTake adds the LifeCool to its notebook cooling product lineup. This cooler is designed for laptops of 10" to 17", it offers a 120mm fan with max output of 66.55CFM and a noise level of up to 30.5dBA and has a plastic design with a metal mesh. The product measures 439.5 x 349.6 x 81.9 mm and weighs 1.132kg. Pricing and availability is unknown. Thermaltake, a cult brand for the enjoyment of entertainment, eSports, technology and lifestyle, a worldwide designer and supplier of high-performance components, with “delivering the perfect user experiences” as our mission, is pleased to announce a global launch of a brand new LifeCool Notebook Cooling Pad for your e-lifestyle and A-entertainment (fruity entertainment). Designed for maximum cooling performance and excellent flexibility, the LifeCool Notebook Cooling Pad extends the lifespan of the notebooks/laptops/ tablet PC and reduces the risk of heat failures of the notebook components. The LifeCool Notebook Cooling Pad is an ultimate cooler with excellent ergonomics between you and your notebook/ laptop or tablet PC while you are working, enjoying games at your desk or on the road. Both appearance and functionality make the LifeCool Notebook Cooling Pad the best possible choice in the market for cooling and entertainment. 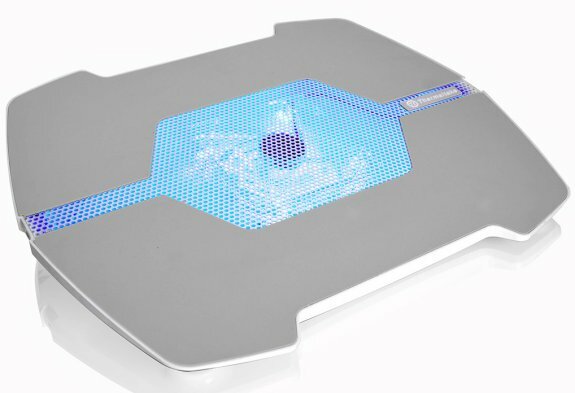 The new Thermaltake LifeCool Notebook Cooling Pad, is set in a delicate attitude and is specially designed toward users who pursuit for a unique e-lifestyle or better entertaining ambiance. High-quality materials and finely structured surfaces, stylish details, the LifeCool Notebook Cooling Pad is styled with a front white metal mesh, presented with a glassy plastic cover and stand/holder and with the cool blue LED light effect, which will definitely be an aid to your inimitable attitude of your cool life. The LifeCool Notebook Cooling Pad not only supports all 10”~17” of notebook/laptop, it could also be a great solution for your tablets too. To the left of the LifeCool has an unmarked mini-USB port, furnished with a 120mm blue LED fan, and accompanied by a on/off control knob which can adjust the fan speed from 800RPM to1500RPM giving you the flexibility you desired under any circumstances. As an additional feature, the LifeCool Notebook Cooling Pad offers a great clench using non-slip, skid proof rubber surface design and ergonomic angel design for a comfortable use while on bed, desk, kitchen/coffee table or by garden/poolside.